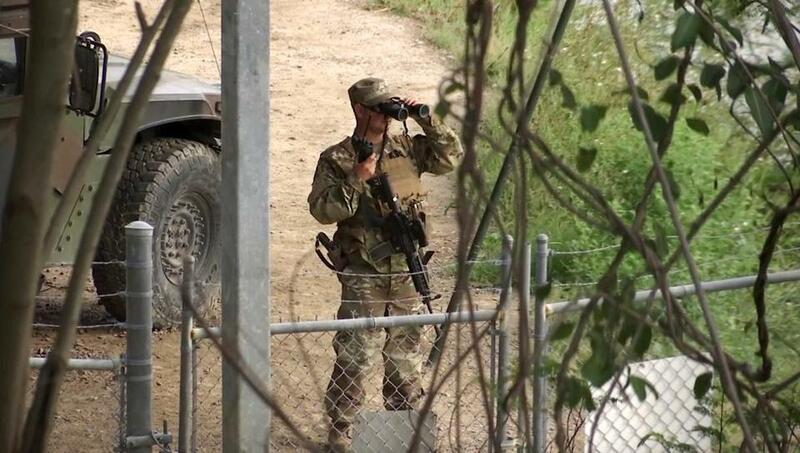 A National Guard soldier watched over the Rio Grande on the border in Roma, Texas, earlier this week. WASHINGTON — The Trump administration has freed about 100,000 immigrants caught at the US-Mexico border in the 15 months since the president took office, newly released government figures show, despite repeated promises to end Barack Obama’s ‘‘catch and release’’ policies. Homeland Security officials say they had to release the migrants — more than 37,500 unaccompanied minors and more than 61,000 family members — because of judges’ rulings and federal laws banning prolonged detentions for children, as well as a lack of detention beds. The number of people caught crossing the border illegally dropped to a 46-year low after Trump arrived in the White House, prompting then-Homeland Security Secretary John Kelly, now the White House chief of staff, to declare that ‘‘catch and release’’ had ended. But after apprehensions spiked in recent months, hitting 50,000 in March, Trump called for sending the National Guard to the Mexican border and — for the second time — vowed to stop releasing migrants while they await deportation proceedings that can take years. Federal officials say they are limited by a 2008 anti-trafficking law that bans returning unaccompanied minors to countries other than Mexico and Canada without a hearing, as well as a 1997 legal settlement that limits how long undocumented children can be detained. Officials say about half the border crossers come from Central America. The government often releases parents and children together because detention facilities do not have enough space to keep them in custody. ‘‘The Trump administration has their hands tied,’’ said Katie Waldman, a spokeswoman for the Department of Homeland Security. Another factor clogging the deportation process is that more migrants are now seeking asylum than in the past. Under federal law, the government cannot deport asylum seekers before their cases are heard in the backlogged immigration courts; many are freed on bond to live and work in the United States. The numbers show the near-impossibility of locking up every person caught crossing illegally, regardless of White House policy. While advocates say the vast majority of border crossers are simply fleeing gang violence and drug trafficking, or seeking a better life in the United States, the Trump administration says freeing them creates a public safety risk. ‘‘Those who break our immigration laws have continued to exploit legal loopholes to the detriment of our national security and the safety of the American people,’’ said Homeland Security spokesman Tyler Houlton. Ending ‘‘catch and release’’ was supposed to be Trump’s No. 2 immigration priority, after walling off the border with Mexico. As a candidate, Trump excoriated Obama for failing to stanch the flow of border crossers and releasing thousands of them to await deportation proceedings. Days after taking office, Trump issued an executive order that said immigrants should be detained until they could be sent out of the country. But that didn’t happen. When Trump summoned the National Guard this month, the White House said the government since fiscal 2016 had apprehended 167,000 parents and children but later released most of them, along with more than 107,000 unaccompanied minors. A breakdown of those figures requested by the Washington Post showed that the numbers were slightly higher. About 200,000 families and unaccompanied minors were freed under Obama. Despite the initial decline in border crossings, more than 98,000 were released under Trump, according to statistics from US Immigration and Customs Enforcement, which releases adults and families, and the Department of Health and Human Services, which takes custody of unaccompanied minors and places them with a parent or guardian. ‘‘I think the president has come to realize that we have a Constitution and a Supreme Court that governs how and when people can be detained,’’ said Gregory Chen, director of government relations at the American Immigration Lawyers Association. Conservative groups that support Trump’s efforts to curtail illegal immigration have grumbled for months about his continuing to release border crossers. The White House said many released minors — nearly 70 percent of whom are teenage boys —have not shown up for their deportation hearings.